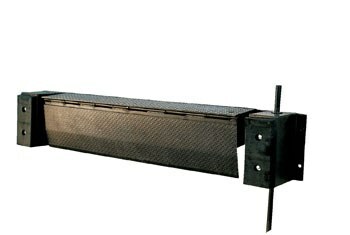 66 inch Mechanical Edge-O-Dock Levelers permanently attach to the face of your dock. For best use docks should be at least 48 inches vertically. A concrete recess in not necessary, but an approach ramp or steel dock edge is needed for installation. Bumpers and installation instructions are included. The ramping comes standard at 26 inches in length, and a 36 inch long ramp is available for shorter grades. To operate, the actuation handle is placed into the pocket of the inner lip and pulled to the floor. The handle is then pushed forward until the lip is resting on the bed of the truck. The lip automatically retracts behind the bumper face as the truck/trailer departs.